A lot of anime are based off of the plot of a manga and/or light novels. Sometimes an anime is an original work that gets a manga story afterwards, but that isn't always the case. I remember watching Amagami, where you could obviously notice that it was based on a game, and some are even named after the games such as Final Fantasy. So how common is it for a anime to be based of a game? I have only seen it once or twice but is it really that uncommon? Or are they just animated in a way that you won't directly notice that it comes from a game unless you already know so? Just like in this answer, let's take a look at /u/homu's data. This basically answers your question right here: between 8% and 15% (avg. 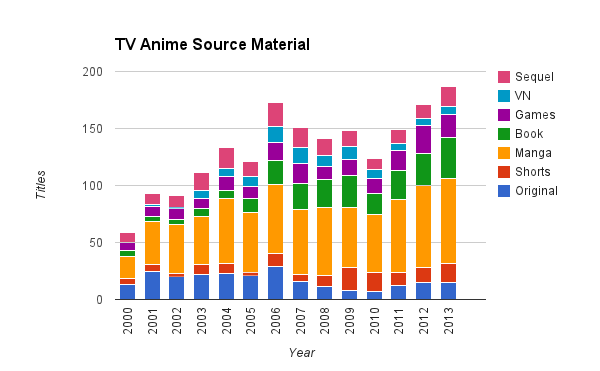 10%) of anime in each year from 2000-2013 were based on a video game of some variety. Games are a minor but not insignificant source for anime. Now, if you're asking "what percentage of video games get turned into an anime", the answer almost certainly rounds to 0%. There are a lot of video games out there (probably in the high hundreds per year, at least), but less than 200 anime per year, only a fraction of which are based on video games. This data set only covers TV anime (thus excluding ONAs, OVAs, and films), but I see no reason to expect that an unusually large percentage of any of those media would be based on games. Indeed. I've seen a few anime based on video games, and while they aren't that common, they aren't uncommon, either. Some anime are literally used to promote games, but these are usually card games like Yu-Gi-Oh! and Duel Masters. One of my favorite anime, Hoshizora e Kakaru Hashi, or Bridge to the Starry Skies, is based off of a visual novel!